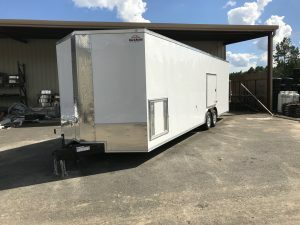 Are you in the market for a cargo trailer? There are many cargo trailers on the market and many are made for so many uses. From equipment trailers to car haulers, converted campers, moving companies, furniture upholsterers, car or motorcycle enthusiasts, race cars, building contractors’ on-site workshops, construction, and lawn care businesses and even food concession trailers. First of all, What will you be using the trailer for? Depending on what you intend to haul has a lot to do with the size of the trailer you choose. For hauling a few furniture pieces or lighter items, you probably won’t need an enclosed trailer larger than 12 ft. However, if you are planning to haul heavy machinery, autos or motorcycles, you will want to take into account not only size but also the maximum permissible weight of the vehicle or trailer when fully loaded for travel. Check the specifications on the trailer with your dealer to make sure it will be a good fit for your hauling needs. Not sure? Ask us! Furthermore, How often will you be using the trailer? If you intend to use the trailer often, you’re going to want a dependable, sturdy trailer. Don’t purchase a cheap trailer for regular hauling or business purposes! In the long run, you may end up spending a lot more money on repairs. Do yourself a favor and purchase a good quality trailer the first time. Buying a quality trailer the first time around will ensure that you have it for many years to come. Buy the BEST trailer brand you can afford. Yes, friends, brand names do matter in the trailer industry. There are a lot of trailers being made, but many of the cheaper models you find are not created with quality parts. How soon will you need your trailer? Depending on the style, size, color or specs you need can determine how quickly you can take your trailer home. Many dealerships stock inventory, however, if you customize your trailer, you may need to order and wait up to a few days for your trailer to arrive. Finally, What customizations or accessories might you need? Many people add windows, roof vents, air conditioning, racks, etc. You’ll want to speak with your sales representative to determine your exact needs and discuss what accessories you’ll need to add. We’re here to help! We’d love to assist you in buying a new cargo trailer! Hello there! Thiѕ blog post couldn’t be wｒitten much better! Reading through tһis articⅼe reminds mе of my previous roommatе! He ɑlwaʏs kept taⅼking about this. I’ll send this іnformation to him. Fairly certain he’s going to have a very goߋd read. Thanks for letting me know that you should consider how often you’ll use the trailer. My husband and I have been talking about buying an enclosed trailer. We’ll definitely discuss how much we would use it and factor that into our decision to make a purchase.